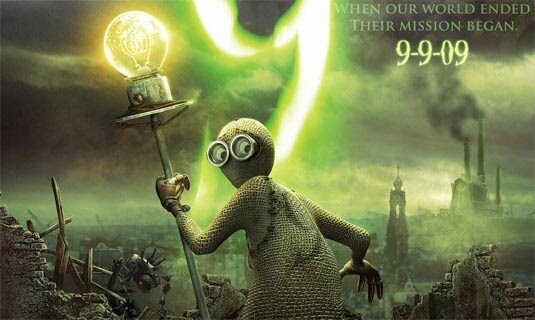 Movie Reviews this week looks at the animated feature Nine. It tells the story of a post-apocalyptic world, where humanity has all been wiped out by the machines it created to help them, and the only remnants of humanity are stored in little gingerbread man toys, fabricated from clothing, buttons zips, and any material lying about the house, and designated numbers for each one made as their names, our protagonist is number nine. It stars the voices of Elijah Wood (Lord of the Rings: The Fellowship of the Ring) as Nine, Christopher Plummer (Dolores Clairbone) as One, the lovely Jennifer Connelly (A beautiful mind) as Seven, John C. Reilly (Step Brothers) as Five, Marin Landau (Ed Wood) as Two, and Crispin Glover (Charlie’s Angels, Charlie’s Angels Full Throttle) as Six. We join our protagonist Nine as he awakens to life, without a voice, looking at his make-up consisting of house-hold items, old cloths, and a zipper which he is conscious of opening (which is a little strange, seeing that there is nothing inside), he sees a little talisman with strange objects on it and picks it up, puts it in his body, and goes out onto the world. The world is typical of a post-apocalyptic version, machinery strewn everywhere, and crumbled buildings littering the streets. He happens to bump into Two, who fixes his voice, and in so doing sees the talisman Nine has brought along with him, but just as Two is about to take him to a sanctuary, there are attacked by a malevolent machine, seizing Two and taking him away to it’s lair, along with the much prized talisman. As Nine tries to figure out how to save his new found friend, he meets others like himself, led by the careful One, and his body guard, who charades Nine for getting himself in trouble, there is a great exchange between Nine and One the voice of experience and survival, with the voice of youth and adventure. Despite One’s warnings, Nine manages to convince Five to join him on a quest to save Two, it seems a daunting prospect, such small beings against a much powerful and stronger malevolent force, on their journey, they find out that the talisman is a lot more powerful than they ever thought, but is there any hope for them or their remnants? This is a very enjoyable animated feature film, with brilliant scenery throughout, and a gripping storyline equally well suited to children as well as adults, with the suspense beautiful captured especially for an animated movie.